Bone building exercises are important for not only keeping our bones strong to ward off Osteoporosis, but also to help us stay upright and balanced. The best exercises we can do for Osteoporosis are those that are done with our own body weight. Some of the best exercises for Osteoporosis are those that involve activities with a high muscular-load component such as: weight lifting and weight bearing activities where you have to support your own body weight, and any activities that pulls or pushes on the muscles and, in effect, the bones. The Wall Slide or Knee Bend exercise shown to the left is helpful at strengthening and bone loading the muscles and bones in the pelvic and upper thigh regions. Those people who participate in these activities tend to have higher bone mass than those who participate in non-weight bearing activities. Pilates exercises, although they seem to be non-weight bearing, do have the very important components of stretching and pulling on the muscles which, in turn builds bone density. They also involve a high component of weight bearing, supporting your own body weight while balancing; on your hands and knees, and especially when using spring tension on the equipment. The standing exercises shown here are ways you can increase your balance and lower body strength and stability and are great weight bearing exercise for osteoporosis. Do the one leg stand by slowing transferring weight into one leg until you can raise the other without changing your upper body posture. Hold for 5-10 seconds and then slowly transfer weight to the other leg. Do this for 5 -10 repetitions daily. 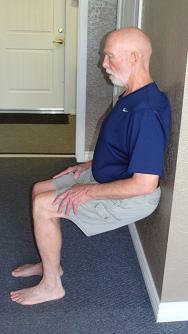 Tips: Stand in a corner or next to a wall for more support. Try doing this barefoot as your feet have sensors that help to balance you and this helps to strengthen your feet and ankles. This weight bearing exercise for osteoporosis is a great one to increase your lower leg, ankle, and foot strength. Leave these bone building exercises and get my brand new Foot Exercise Ebook here. A recent study in the Journal of Applied Physiology, found that the effects of power training over regular strength training was more beneficial in building bone density and muslce strength. What this means is that the speed of the lift is a faster, yet still controlled pace, with no hesitations in movement. I have incorporated this power training concept into my own clients workouts and they not only feel the benefits in their body as they get their heart rates up, but they enjoy the varied speed of movement as well. Most of them just think they are getting done sooner. Whatever motivates them! Warmup: 10-20 minutes of Range of motion and stretching exercises. Time:	20-30 minutes of weight bearing exercises. Exercise Selection:	6-10 exercises that focus on legs, back, abdominals, and upper body exercises (while standing). Intensity: 75% of 1 repetition maximum lift or about a 7 on the Perceived Exertion scale from 1-10. Repetitions: 8-12 repetitions at a fast controlled pace. Cooldown: 10-20 minutes of stretching to elongate the muscles and decrease the feeling of pain and stiffness later.